This morning I got up early for a Saturday…even set an alarm for 7:15am. 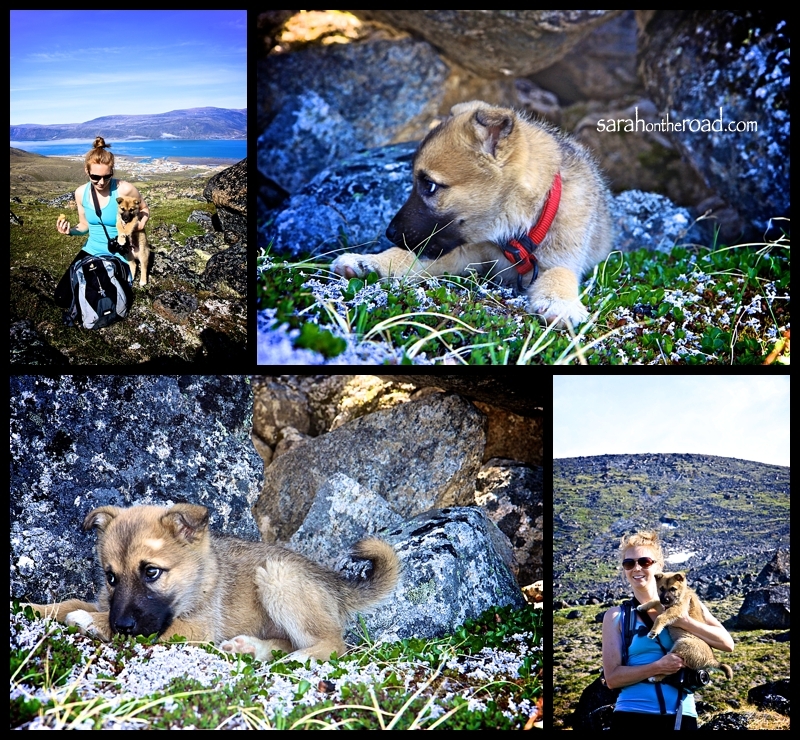 The reason was that I joined 5 other people and Charlie( the puppy) to climb up Mt. Duval. This was my first climb of 2012. (I had climbed it October 2011 with friends…and 3 times over the summer of 2009: HERE, HERE and HERE!) It was a gorgeous day…sun shining when I got up at 7:30am…after a bit of breakfast and a chance to wake up we left my house about 8:30am. Here’s some shots from the start of the trip. Just keep on hiking one-foot-in-front-of-the-other-foot that’s the way it’s done. About 1/4 into the climb I didn’t think I would make it to the top. I was DONE. I had starting lagging behind the others… and my legs were screaming at me (mental note: need to start doing my phiso exercises / stretching out my achilles tendons again…). 3 people in the ‘climbing’ group…needed to be up and down the mountain by around 2pm. This was so that they have time to collect their bags and head to the airport. Just wanted to acknowledge how CUTE Charlie is. Most people who know me know I’m not really a dog person…but this little puppy today totally found a spot in my heart! So there I was… my whole body and mind screaming at me to stop. Give up and head back home. Tons of funny thoughts through my head… but then it became this game. Finding something far away and saying to myself, “…once I get to that rock (the big one in the middle with the red on it)…we can stop again, and re-evaluate our options”. 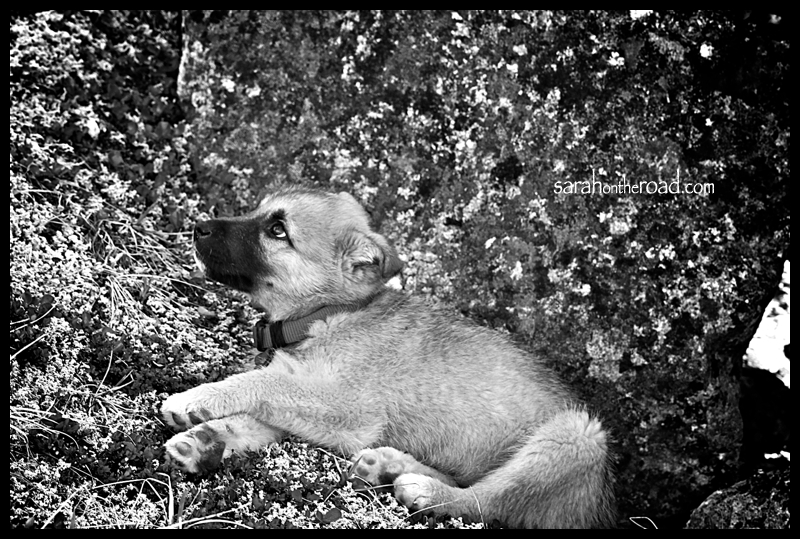 It wasn’t just my fitness… it was actually about the puppy too… because it was so hot, he had to take rests… and for the whole hike refused to be carried in a backpack (something he did the week prior on a hike). My friend did pick him up and carry him for bits along the way though! 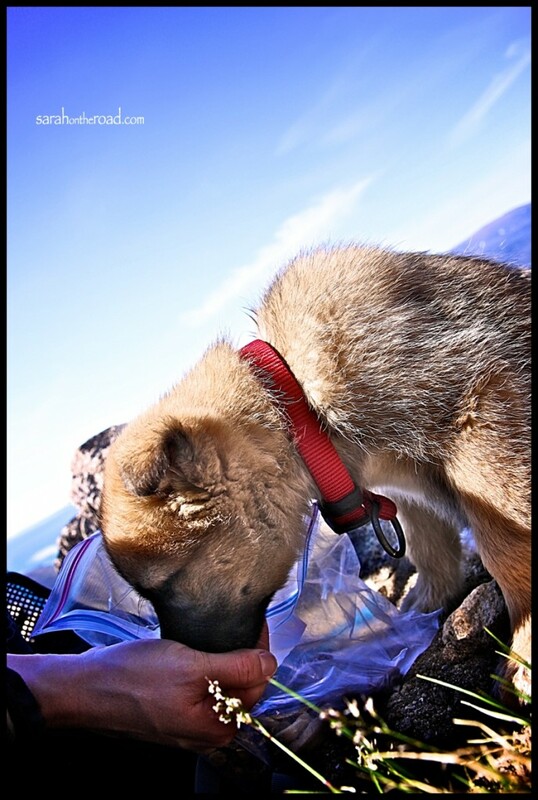 So we stopped a lot… had water, snacks and shared stories. 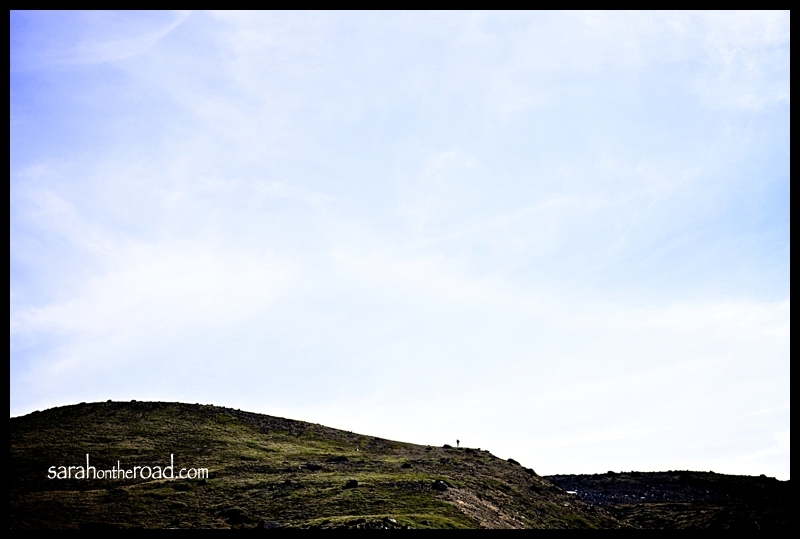 Can you spot the lone person on the ridge? 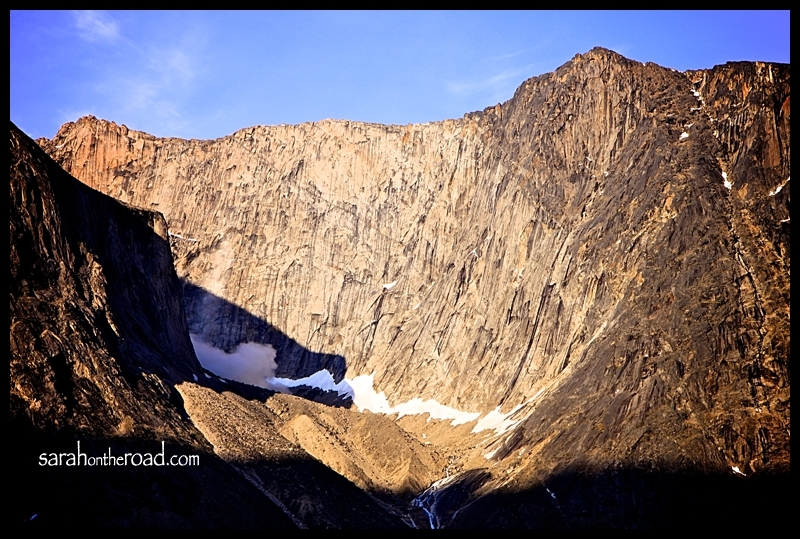 I knew from previous climbing experiences of Duval–once you hit the ridge, you can walk it up to the look-out. 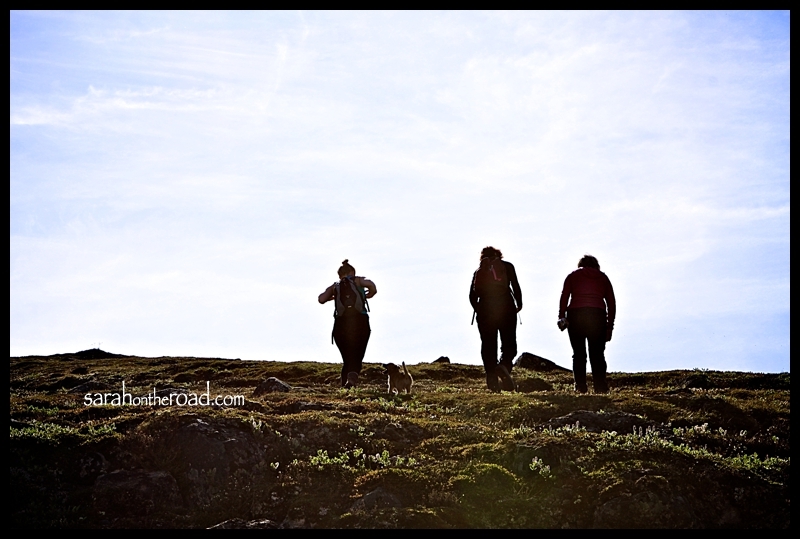 (yes, it still is up hill…but harder, not so bouncy tundra.) After taking this photo I was all about just getting to that ridge. Before I got to the ridge… I wasn’t sure if I would keep on going. It was hot, I was tired…and my body was starting to scream with every step I took. 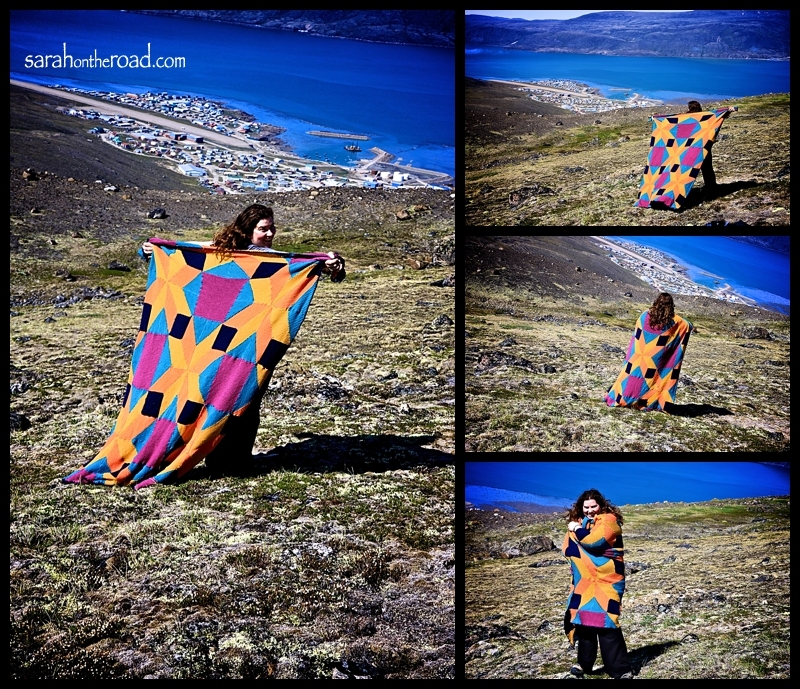 I got this crazy idea to hike Duval with my afghan in a stuff-sack so I could get some photos with me + afghan + Pang. 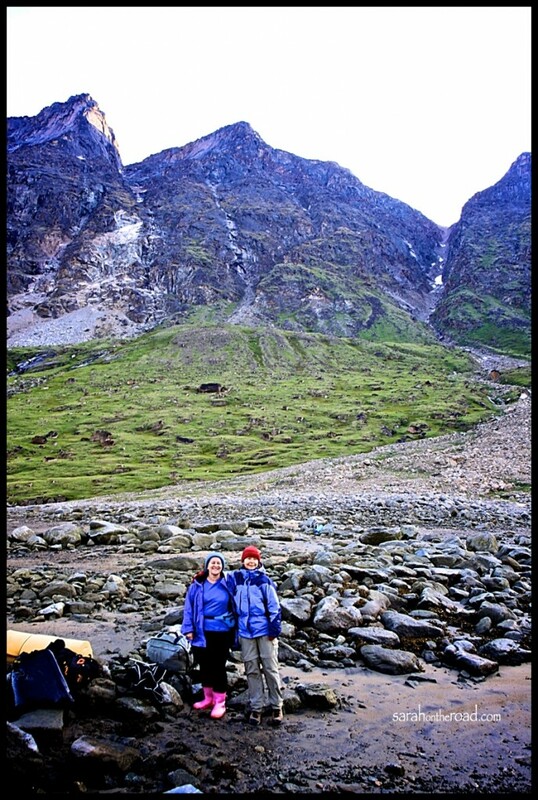 But really…doesn’t everyone like to hike with an afghan? We met up with the other group of 4 climbers. They were on their way down… had been to the top! Their encouraging words made me want to get to the top. 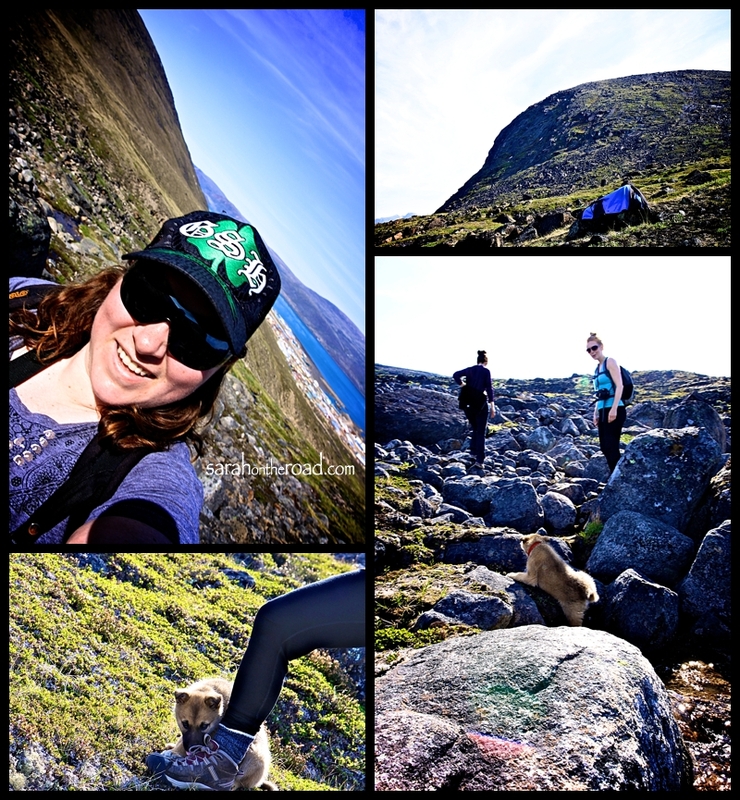 So putting one-foot-in-front-of-the-next…taking breaks for the puppy… getting to one inuksuk then the next… in about 30mins I was at the top of Mt. Duval! I was greeted by this awesome view. 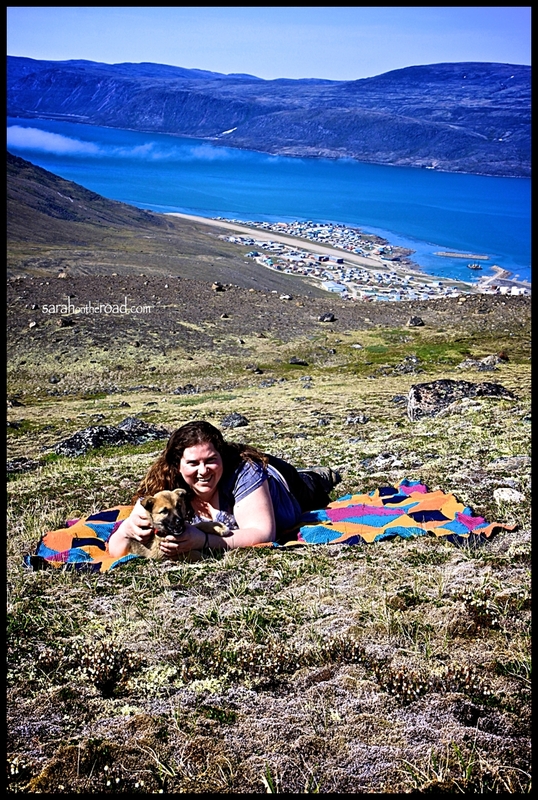 …one more shot of me & the afghan! Then it was time to head down the mountain. It was awesome to climb it with friends, some old and some new. Friends helped make the climb so much more enjoyable. All in all it was a 6 1/2 hour trip. 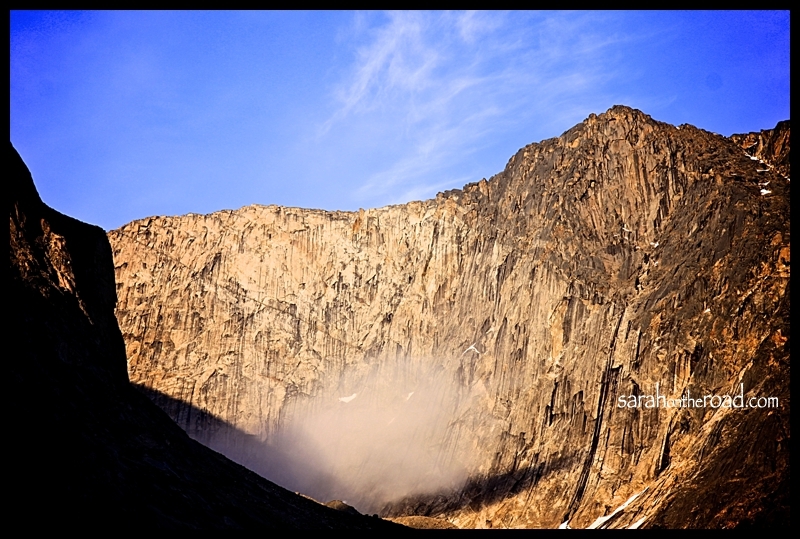 I’m glad I pushed my body to climb, realized I have some work to do…but everyone has a starting point. For my ‘first’ official hike of the season I’m so glad it’s done, but even more thrilled that I did it! 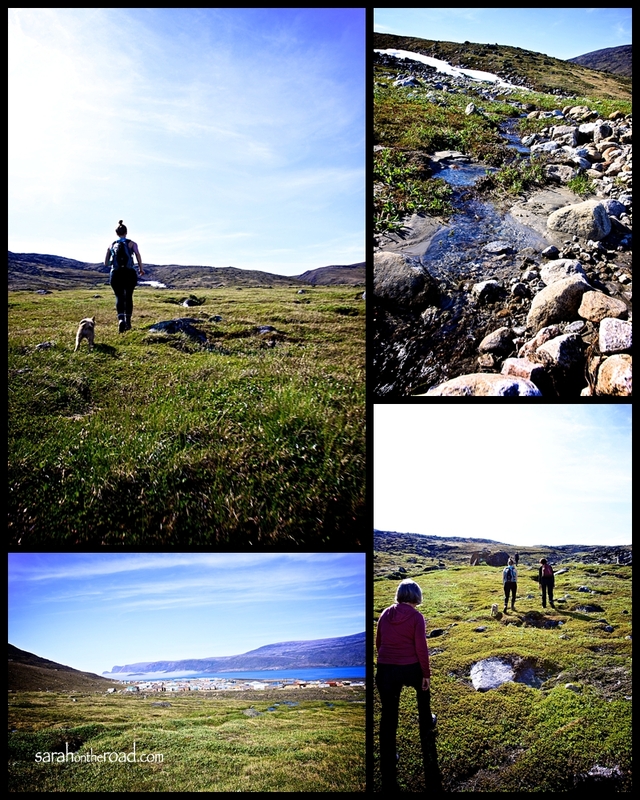 This entry was posted in Life in Nunavut, Walk in the 'hood and tagged Pangnirtung on June 30, 2012 by Sarah on the Road. 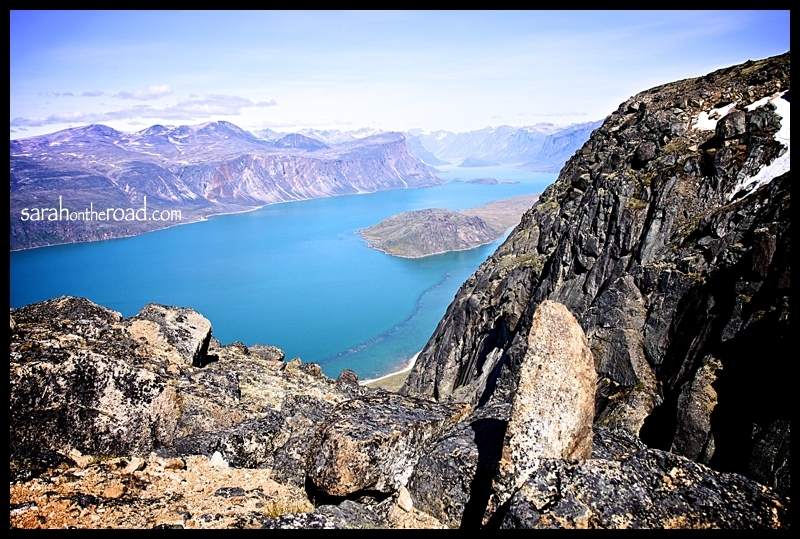 Friday I found out that two friends were heading into Auyuittuq National Park to do some camping over the long weekend. 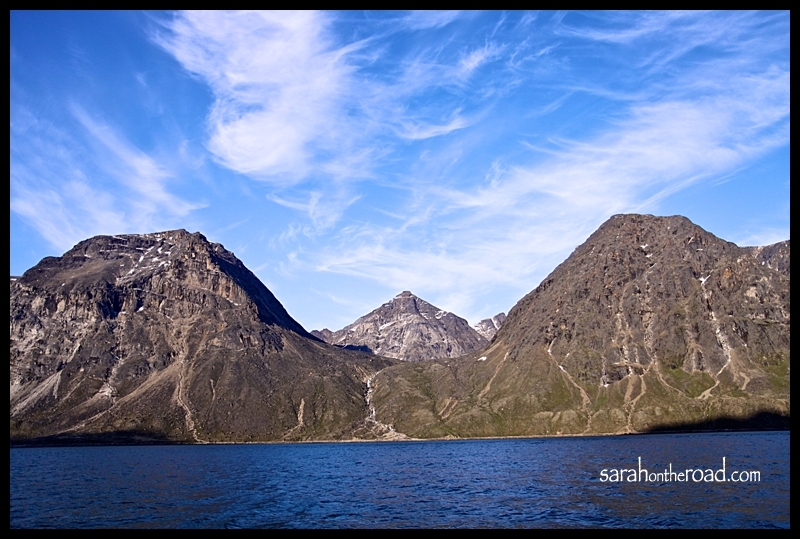 The entrance is located just outside of Pang…a short boat ride up of about an hour up the fjord! I talked to Peter Kilabuk who runs an outfitting company PEO Services. He was dropping of my friends for their camping trip. I asked him if I could ‘tag-along’ in the boat. He agreed… so off I went for an evening of boating-a perfect start to the Canada long weekend! 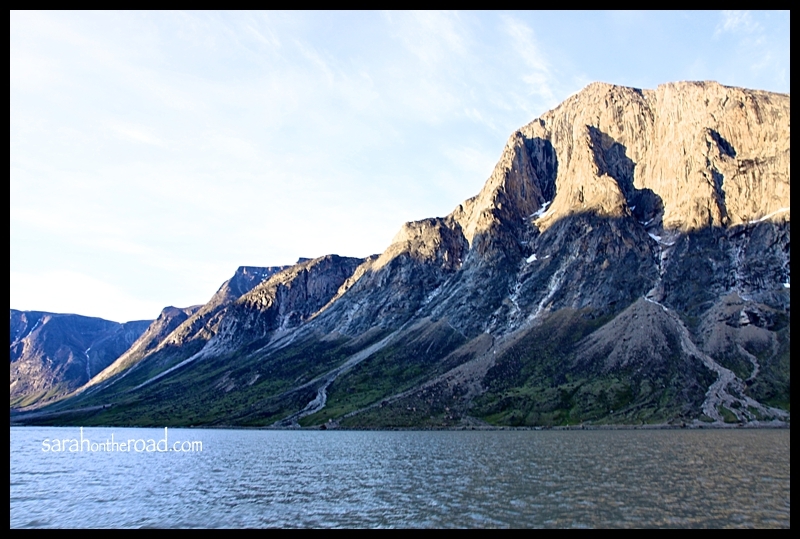 I visited Auyuittuq National Park when I lived in Pang in 2009… (click on the link to see photos from that trip…Arctic Circle and Crater Lake). I was excited to see it NOT covered in snow, it was a perfect evening to head out. We left Pang around 7:30-8ish. The sky was so pretty… with a few clouds! The landscape here with the mountains is just so stunning. 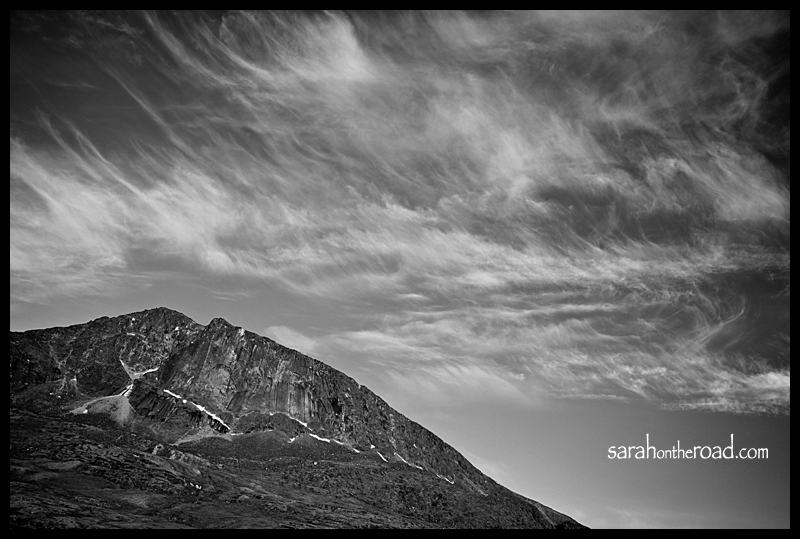 Every time I go out, I can’t seem to capture enough of their jagged peaks! Along the way to the park Peter stopped to tell us various stories and history about the area. This was Peter’s favourite spot. Can you see the 5 Mountain Peaks in the photo? 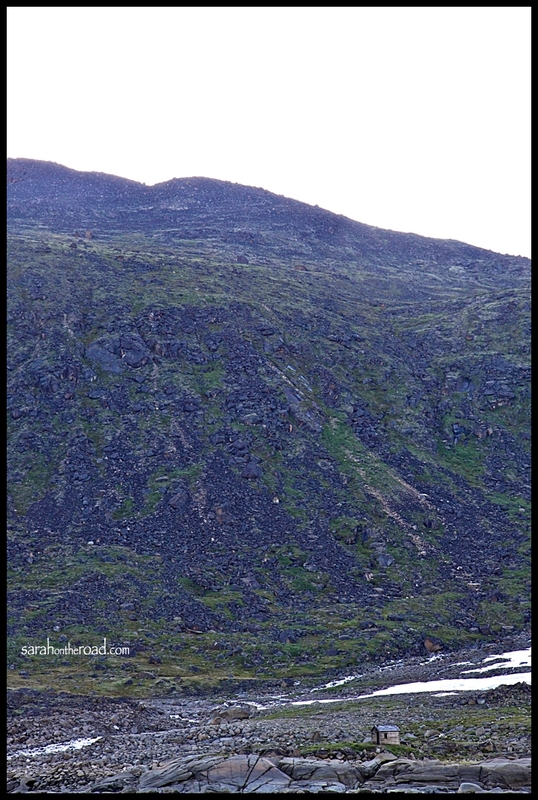 Caribou use to be very prevalent around Pang…this was a great spot to find them. Peter said, if there were lots of tracks heading up the river. It was a happy time, the 5 mountains created a ‘bowl’ and the caribou couldn’t escape, and that meant lots of food to eat! It’s amazing how fast the tundra can come alive..and GREEN after being covered under snow and ice! Below is a photo of a small cabin known as the ‘Hudson’s Bay Cabin’. Peter’s parents stayed here in their first years of their marriage. (I’m guessing in the 40s/50s?). The Cabin is about 8X10..very small. It was built by the Hudson’s Bay Cabin to help encourage Inuit to hunt/trap fox. Peter’s dad had trap lines…along the ridge of the mountain and in the area. 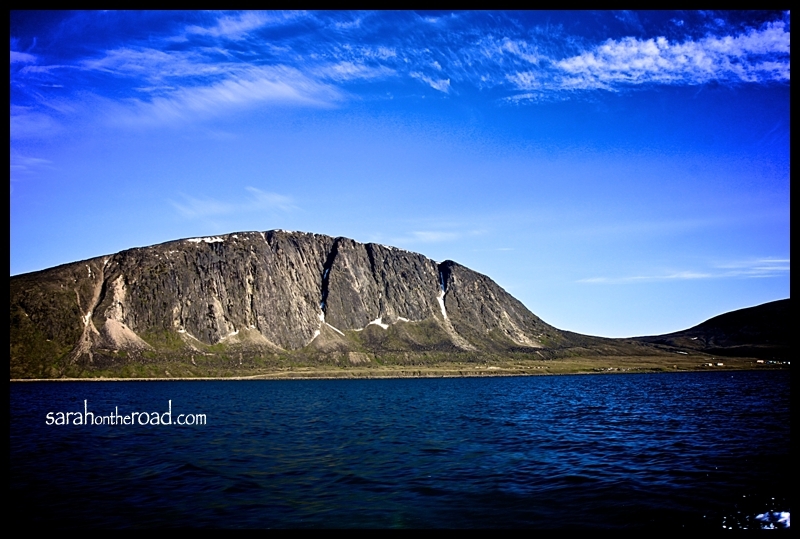 It’s amazing that it still is standing today, but not surprising as the Arctic really is a cold desert! We reached the end of the fjord..and the entrance to the Park. 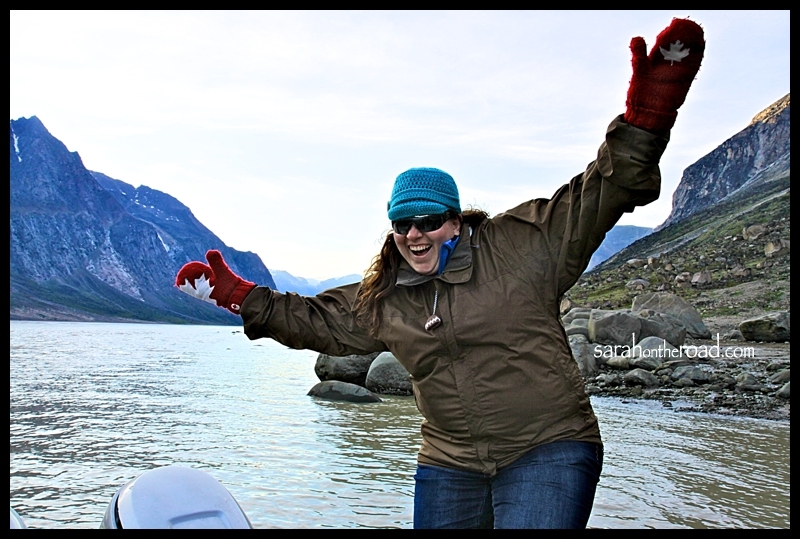 We dropped off my friends on the left side of the fjord. I can’t wait to hear about their adventures and camping stories! 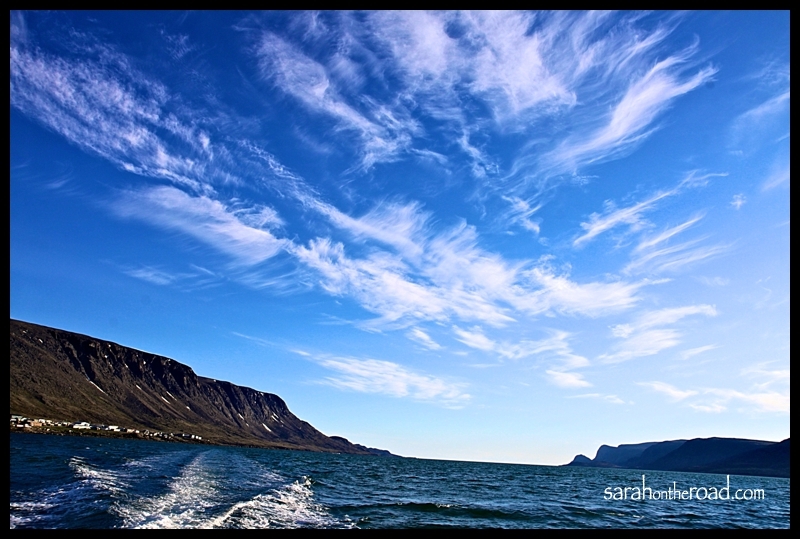 I must admit when the boat pulled away I was a bit envious. I need to get some gear so I can camp! 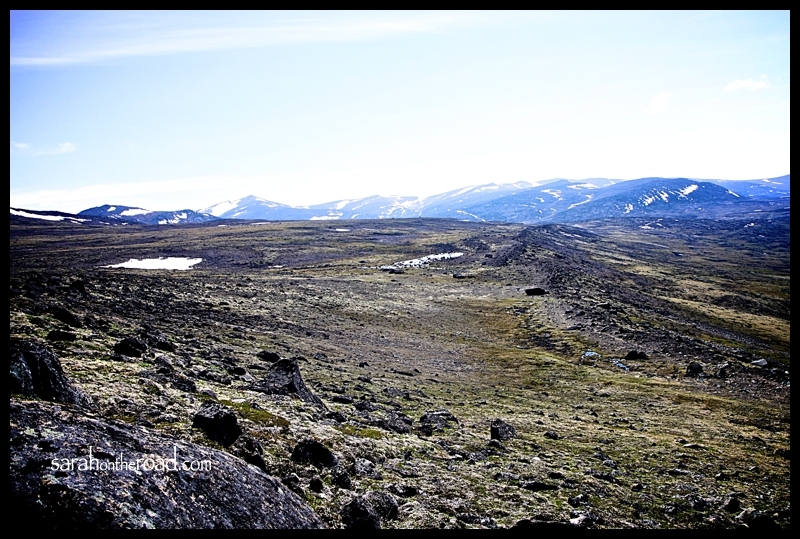 I love this photo…because I think it captures how HUGE the landscapes are… I find it’s so hard to gauge in a photo, because we have no trees…or other ‘reference’ points that a mountain scape in the south would have. People put it into perspective though! Just after I snapped this photo… a HUGE thunder happened. 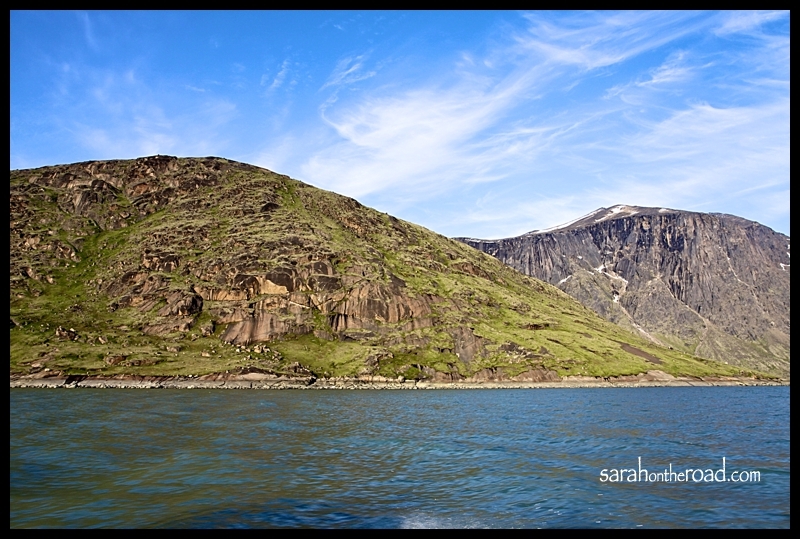 We looked on the other side of the fjord-rock slide! Overlord the mountain that marks the official entrance to the park! 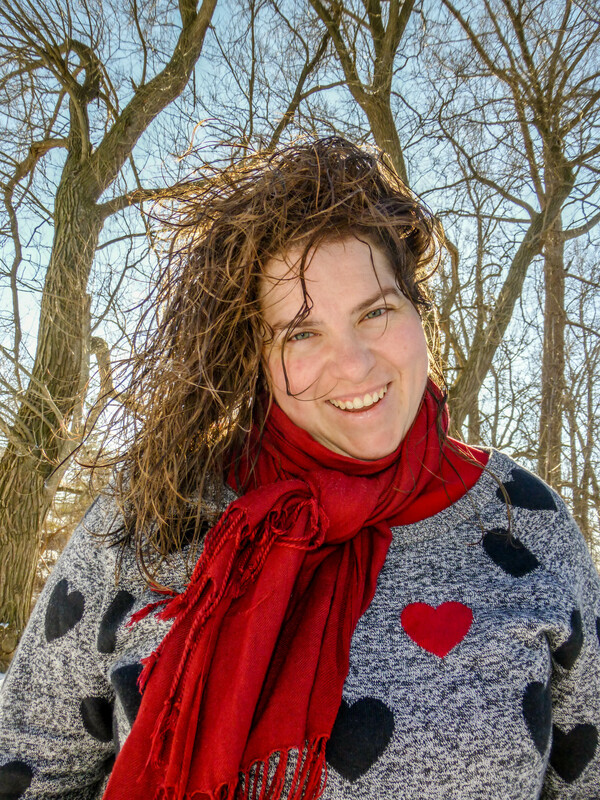 Random Fact about this photo: Slightly geeky moment… I didn’t realize I had TWO different mittens on until after I got home and looked at my photos. Yes, they are both ‘Hudson’s Bay Olympic mittens’…one from Vancouver 2010 and one from Winter 2011! At least I picked two opposite hands AND they are my “CANADA” mittens, so seems appropriate! 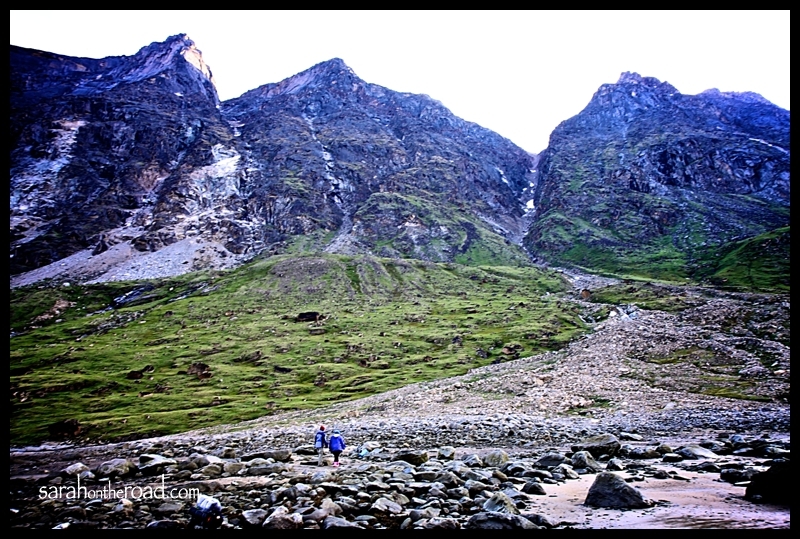 Just before getting back into the Pang Harbour… I snapped this photo. I love how the sun is setting…and there is random spray from the boat at the bottom! This photo was taken about 10:15pm (ish)! Thanks Peter for sharing your stories and knowledge…it was great boating with you tonight. I’ve had so much fun already this long weekend. My wish is that everyone enjoys their long weekend! Sending heaps of love to my family at my cottage in Haliburton Lake have a blast and…next weekend I’ll be with you!!! 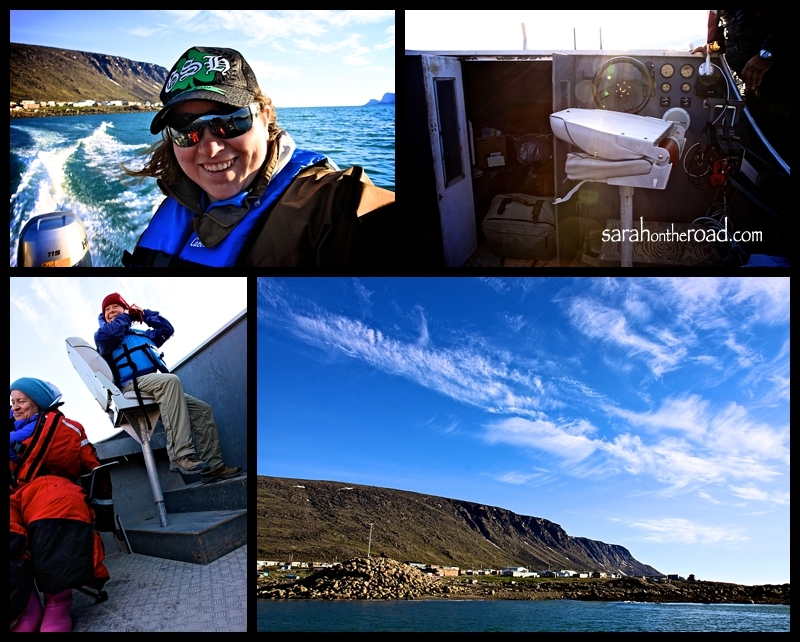 I have a few more adventures planned for this weekend… stay tuned for more updates! 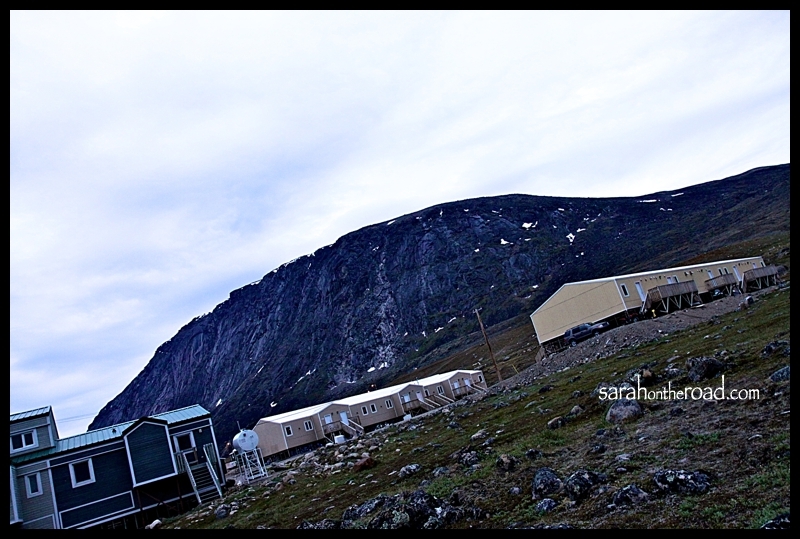 This entry was posted in Life in Nunavut and tagged Pangnirtung on June 30, 2012 by Sarah on the Road. 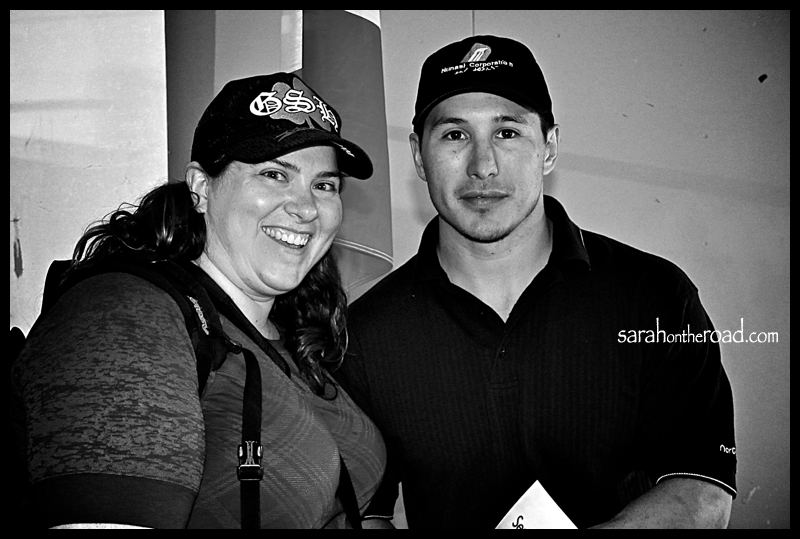 Jordin was the first Inuk player to play in a regular season game in the NHL. He grew up in Rankin Inlet, Nunavut. 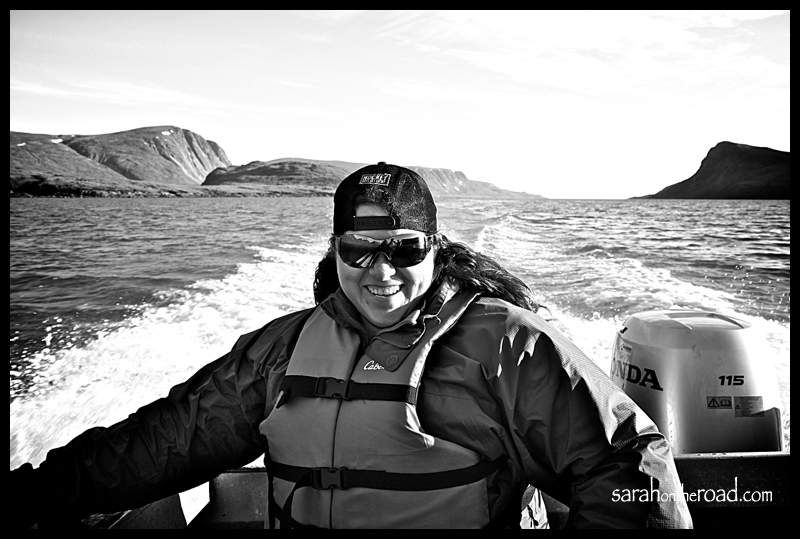 He is a spokesperson for Canadian North, this week he was on a tour of some of the communities in the high arctic and southern Baffin Island. It was so exciting to see all the young hockey players… in the jersey’s listening to Jordin’s community presentation. He spoke about his own experiences with tough issues in life. Talking openly about suicide (his older brother committed suicide) and his own addiction problems… The message I took away from it was for anyone feeling those types of feelings (suicidal) to make sure they TALK to someone because it will help! Don’t be afriad in getting professional help…if you need it to help with your addictions. Jordin also presented each graduate with a jacket. He spoke of staying in school…doing homework before hockey. It was a rule for him growing up…and he’s glad he finished high school. I managed to get a quick shot of us together, as well as an autographed poster! 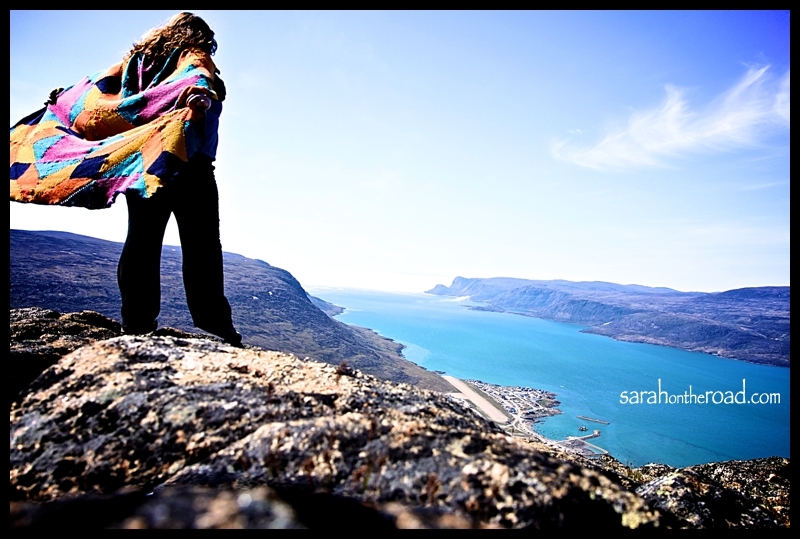 This entry was posted in Life in Nunavut and tagged Pangnirtung on June 29, 2012 by Sarah on the Road. 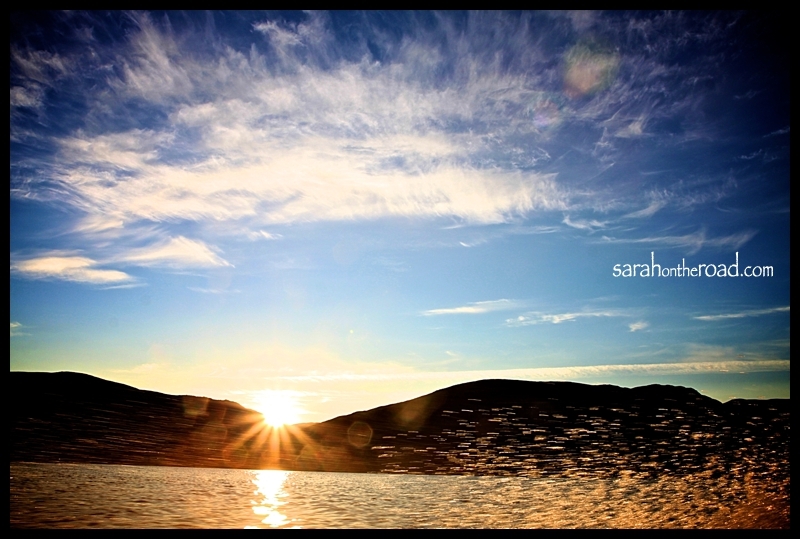 This entry was posted in Wordless Wednesday on June 27, 2012 by Sarah on the Road. Another Great Canadian Blog Bash (#TGCBB) Giveaway!!! I’m really excited, in just 10 more days I get to go see my friend Lisa! I just realized it’s been TWO YEARS since we have seen each other in person. Have no fear with the help of online social networking…blogs, Facebook, Skype, MSN and email… we do keep in touch really regularly!! That’s one of the great things about living so far north, technology makes it so much easier to stay connected! Lisa authors a blog found at Learning Titus 2… told me all about the Great Canadian Blogging Bash. Lisa is hosting a giveaway for the Great Canadian Blog Bash with a little help from me! 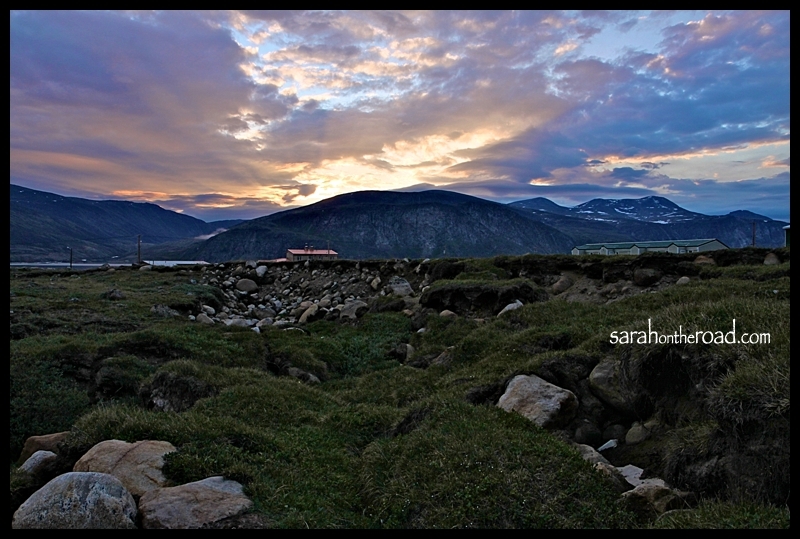 Ever want to have a photo of own of my images on your own walls at home? Here’s your chance. 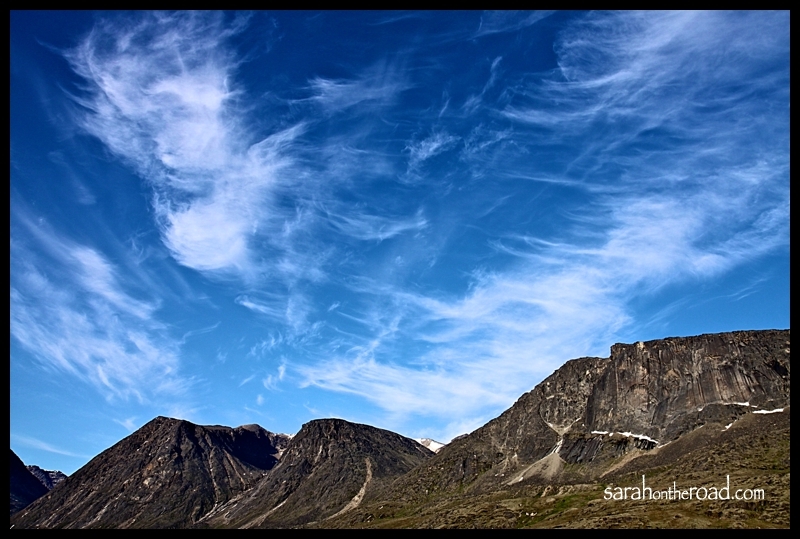 I have donated a 12×18 print of ONE of my Photos from Nunavut. Lisa picked choose three photos I have taken that were her favourites and now is offering you a chance to win ONE of them! Head over to Learning Titus 2 to enter! 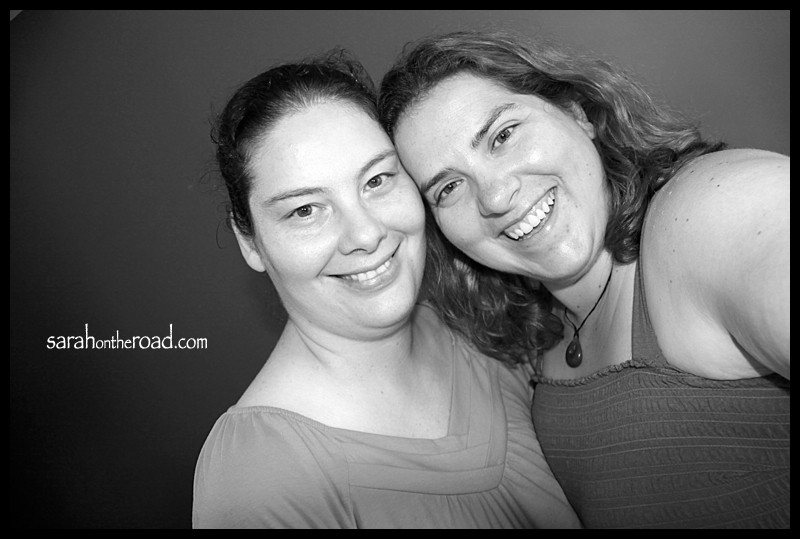 This entry was posted in Blogging Community on June 26, 2012 by Sarah on the Road.